The state of Alabama is lovingly referred to as “Alabama the Beautiful” for good reason; this state has quite a few sprawling parks that offer break taking views and fun-filled activities. Oak Mountain State Park is the largest park in Alabama with more than 10,000 acres of majestic land. There is truly something to do for every nature lover. Golfers can play the picturesque 18 hole golf course at Oak Mountain State Park, and there is a golf pro shop available that offers equipment and mementos of the experience. While golfing, a person is sure to work up quite an appetite, so there is a snack bar available. Guests can enjoy a menu full of tasty treats. If galloping through the park is your desire, this wish can be accommodated. Visitors can bring their own horse and board the beautiful animal for $20 per night, or visitors can pay anywhere from $10 to $50 for an hour and a half ride. The park offers a variety of horses for the guests’ riding pleasure on Wednesday through Sunday. Visitors that would like to ride on other days can simply make a reservation in advance, and the minimum age for riding is 8 years old regardless of adult supervision. Ten secluded cabins are available for rental. After hiking and biking the scenic trails, guests can retire in one of these cabins. They are spacious and provide comfortable lodging. Picnic lovers will enjoy the many grills and tables available throughout the park. Bring the food, and Oak Mountain State Park has a place to grill it and serve it. In addition, the young and old can enjoy the petting zoo exhibit. It is best to call to check the visiting schedule. The park’s staff can be reached at (205) 620-2520. The mailing address to the park is 200 Terrace Drive, Pelham, AL 35124. Also, the official website can be reached by going to http://www.alapark.com/oakmountain/Attractions. The website offers a detailed description of all of the amenities available at this great Alabama park. There is an abundance of fresh fish in the lakes at Oak Mountain State Park. Fishing lovers can rent aluminum john boats for a cost of $15 per day for regular visitors, and seniors get a good discount on the rental. Seniors pay only $7.50 per day for the boat rental. Visitors that want to bring their own boat are free to do so, but the park does not allow gas motors in these waters. Paddles and life jackets are also available for use in the water. As always use extreme caution while fishing, there is a no alcohol policy, and there is not a lifeguard on duty. 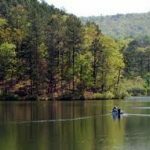 Swimming is allowed in the park, and there is not an additional charge for swimming at Oak Mountain State Park. Swimmers are free to enjoy the sparkling waters of Alabama. Animal lovers will enjoy seeing animals in the wild at the park, and there is also a Wildlife Park. There are numerous orphaned or injured animals that are cared for in this facility. People can witness the great work done by the Alabama Wildlife Center at Oak Mountain State Park. Campers will enjoy the ample amount of space available for RVs and Campers. Visitors can hook up their RVs and enjoy many of the comforts of home while staying in the park. A great time awaits you at Oak Mountain State Park in the beautiful state of Alabama. The beauty of the outdoors is enough to draw you into this magical place. The greenness of the grass and brilliance of the flowers is simply amazing. An individual, couple, or family can truly get away from it all and enjoy the beautiful scenery. Boredom is not an issue either; there is much to do to experience the full scope of what this park has to offer. A person can stimulate almost every passion while staying at this park. Fortunately, the admission fees are quite modest, and the fees for other activities are also nicely priced. Thus, you do not have to spend a fortune to have a great vacation, trip, or just a day at the park. The time is now. Come experience the beauty of Oak Mountain State Park.